Mason Caton-Brown in action for Wakefield last season. PIC: Allan McKenzie/SWpix.com. Mason Caton-Brown could be on his way back to Wakefield Trintiy as the club seeks to fill the void left by Tom Johnstone's absence. Johnstone is set to miss the remainder of the Super League season after rupturing his ACL in last Friday's win over Hull FC. 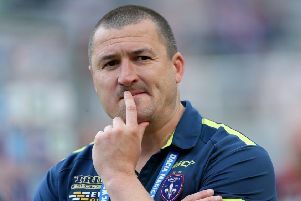 Head coach Chris Chester admitted that Caton-Brown was one of the more "obvious" players who could be available as Wakefield search for a replacement. The 25-year-old winger scored 26 tries for Trinity during an 18-month spell before moving to Toronto Wolfpack last summer. The Wakefield chief also identified Krisnan Inu as a possible replacement. Inu left Widnes Vikings after they entered administration and is yet to sign a permanent deal elsewhere. "We will get this week out of the way and then we will look at the market and see if there is any quality out there," said Chester. "The obvious one is Mason Caton-Brown, I am led to believe that he is playing rugby union. "I have read something regarding Krisnan Inu and Jodie Broughton but we will wait and see what happens. "We are just very, very thin in the outside backs and can't afford to pick up any more injuries there." 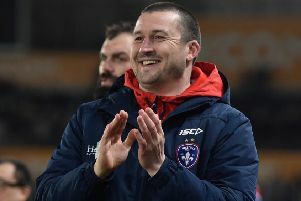 Chester admits that Wakefield won't be making any new signings before Thursday's clash with high-flying Warrington Wolves. He added: "I will sit down with Michael [Carter] after the game on Thursday and we will look at potential targets. "But we are certainly not going to rush into anything, they have got to be the right fit for the club." Grab your official Wakefield Trinity match programme for Thursday's game in last Friday's Wakefield Express.